Capacity Excellent result for insulation grade PVC, Sheathing grade PVC, XLPE, LDPE, FRLS and Nylon. We are one of the leading manufacturer of PVC Cable Machinery Plant and our product is made of good quality. With an industrial experience of 40 years, we have successfully achieved a strong position in the international market by offering screw extrusion plants and plastic extrusion machinery. Our range of machinery encompasses extruder plants, PVC pipe extrusion plant, HDPE pipe extrusion plant, vented screws, single screw extruder plant, PVC profile extruder plant, conical screw extruder, conical twin screw extruder, twin screw extrusion line, recycling plant etc. 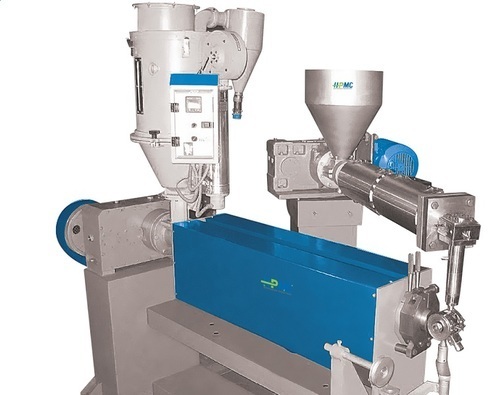 These extrusion machines find application in various extrusion processes. Our stringent quality testing process and timely up-gradation in research facility allow us to maintain international standards of our products. Due to our cutting edge technology and engineering excellence, we have earned accolades from our esteemed clients like Kalinga cables, Delhi, Pioneer Plastics, Nepal, Oswal Pipe Ind., Bikaner and Indian Builder Cent., Guwahati.